The beta build for ErnCon, a new space shooter by Android veteran Woo Games, is now available in the Android Market. ErnCon is a top-down (and very intense) multiplayer shooter for eight simultaneous players over Wi-Fi, 3G and 4G. 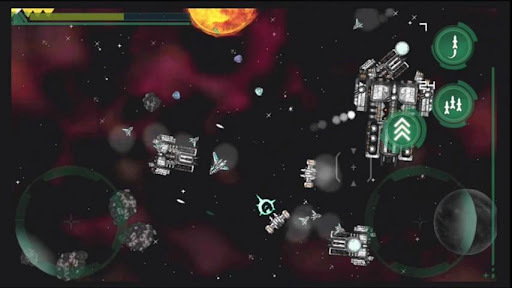 Space aces can choose between fighters or robots (three of each) and more than 15 weapons, including Homing Missiles, Seeking Mines, Rail Guns, Attack Drones and more. To participate in the Open Beta, just head to the Android Market and download Erncon. For now, the game will only be available in the U.S., Canada and Europe due to server availability. In-game purchases will also be disabled for the duration of the beta. ErnCon is free-to-play. Players can purchase new levels, fighters, robots and weapons with the XP earned in-game or for those who like to skip ahead by spending actual money. Add friends and send them boosts to help them in combat. Friends can send back boosts in return! Looking to innovate on the promising Android platform, Ernest entered the Android Developer Challenge 2 in 2008 with his first Android title, FRG , becoming a top 20 finalist in the Action&Arcade category. Since that promising start, Ernest has developed games for various other platforms including a lit pressure-sensitive dance floor at LightSpace Corporation and smartphone browsers at MocoSpace. Ernest fell in love with games on the legendary Commodore 64 when he was 8 years old. Inspired by the Atari VCS/2600, NES, and PC, he realized that making games was his true calling. In high-school, for example, Ernest surprised his entry-level programming class with the predecessor of ErnCon, a 1-on-1 space shooter based on Star Control.